Contemporary design wall art sculpture made from mdf with metal hooks. 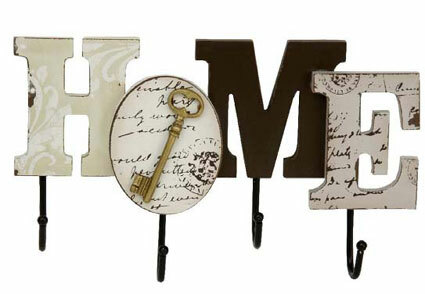 Size is a 16cm high and 30cm wide (6x12"), and this is a mdf cut out of the word 'home' that is set with attractive prints on each letter. It is also set with hooks that comes away from the wall 4cm so perfect for hanging your hat, scarf or light items on! !